Sundays are Game Days in our house. While first thing in the morning I like to do errands like grocery shopping, menu planning, and laundry, I like to be back home and ready to go by noon. Many Sundays we don’t even eat lunch because we like to have snacks while we watch the football games. It’s fun to watch the games because we don’t like the same teams. Having a rivalry is fun because we can each cheer for our own team. It’s even more fun when we have friends over and they have their favorite teams as well. Because of where we live there are 3 teams that are each 2 1/2 hours away from us. There are an equal number of people in town, and in our circle of friends, that like each of these teams. Since most of our friends and family enjoy watching football it’s a great time to get everyone together. I also like it because I don’t have to make a huge meal when people come over to watch football. 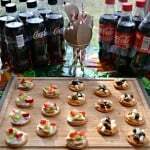 All I have to do is make some snacks and appetizers and serve them along with Coca-Cola Classic and Coke Zero. 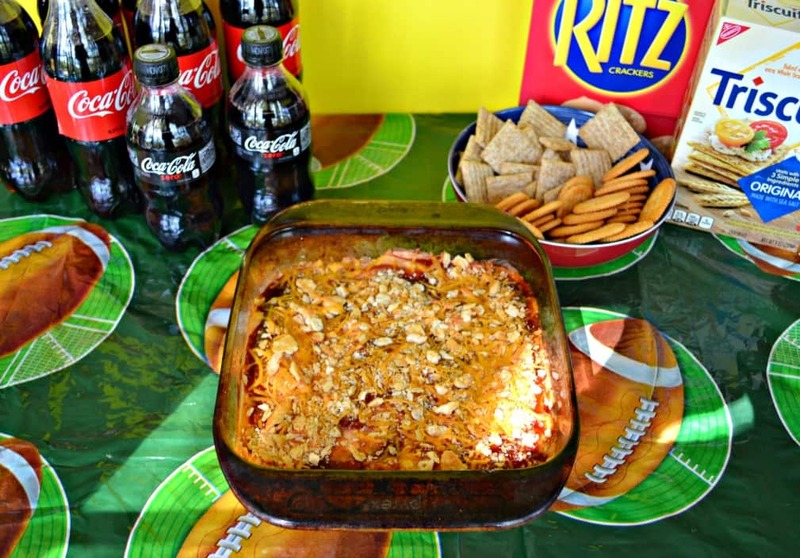 One of my favorite football snacks is BBQ Chicken Dip. I posted about it 5 years ago when I had a pretty good recipe for it. Since then I’ve been tweaking it and serving it to the football fans at our house and I think I have the final recipe down. It’s similar to the original recipe but I’ve changed the proportions of the ingredients and I’ve added a few things to the top of the dip. I headed over to my local Kroger store to get everything I needed to make this dip as well as a few beverages. 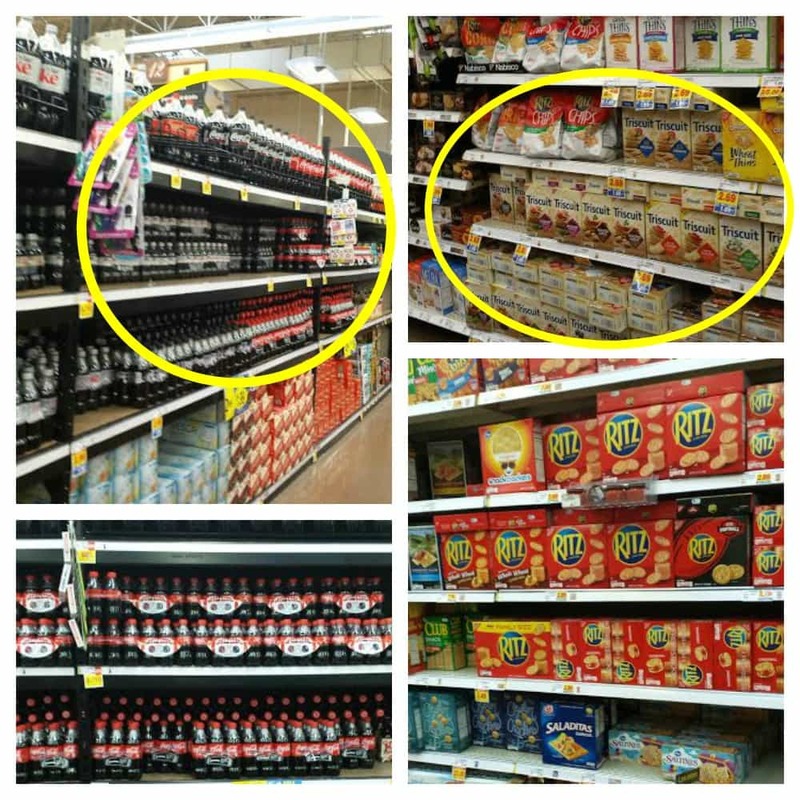 Kroger is my one stop shop for Game Day foods and beverages! This dip is great because it isn’t as spicy as the Buffalo Chicken Dip that everyone serves during football season. While I’m a fan of buffalo chicken dip, sometimes I like something that is a little less spicy and that everyone can enjoy. This BBQ Chicken Dip fits the bill. It starts with a cream cheese and sour cream base mixed with seasonings, BBQ sauce, and cooked chicken. Then it’s topped off with a combination of BBQ sauce and buffalo sauce as well as crushed RITZ crackers and cheddar cheese. The BBQ Chicken Dip is awesome. It’s served hot along with your favorite crackers. I like to serve mine with RITZ crackers and TRISCUIT crackers because they hold up well to a hearty dip. The dip is sweet and just a bit spicy and is filled with cheese and chicken. 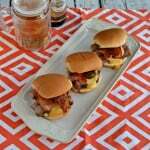 You can use your favorite flavor of BBQ sauce to give it a customized flavor. 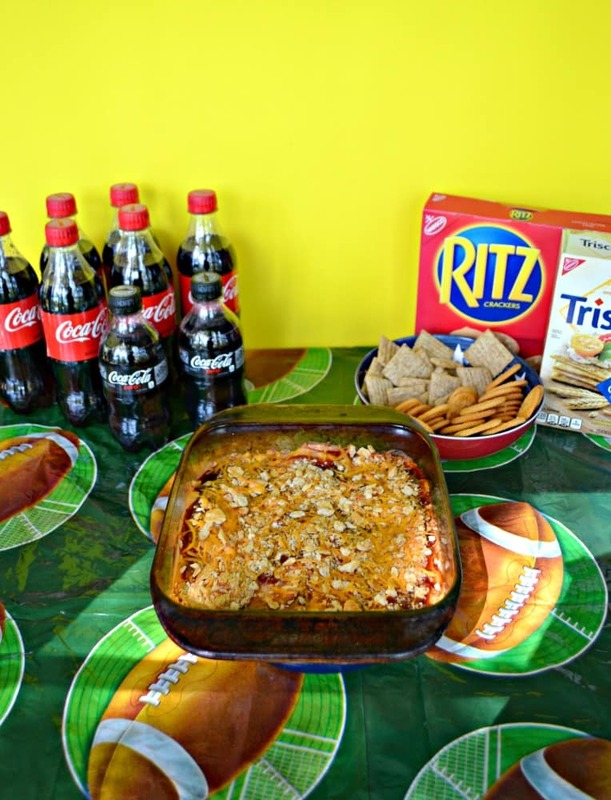 Whenever I am serving this dip for Game Day I like to serve Coca-Cola Classic and Coke Zero to help wash it down. 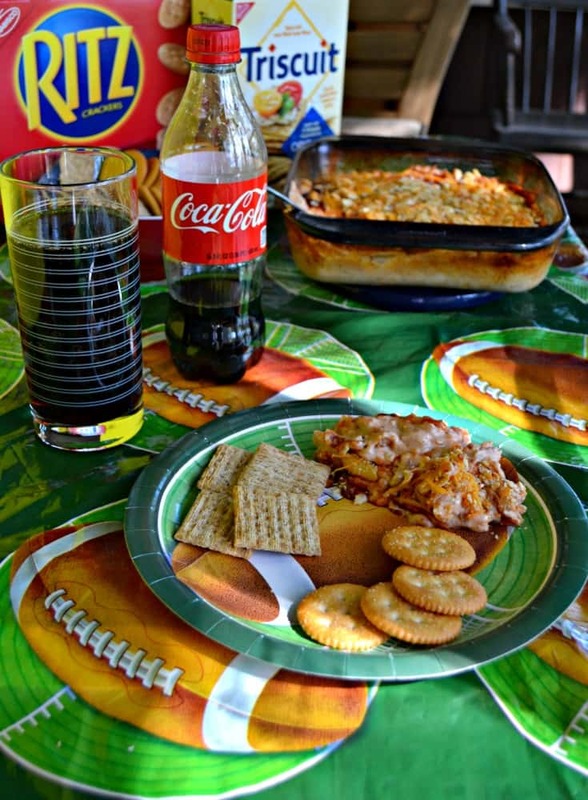 Coca-Cola Classic is the perfect pairing for all my Game Day recipes. 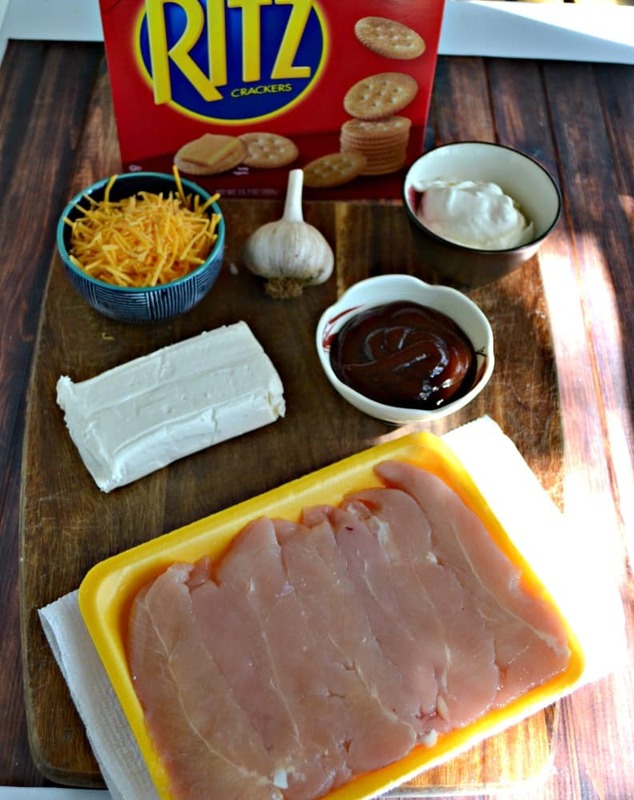 A delicious Game Day dip filled with chicken, cheese, BBQ sauce, and spices then served with RITZ crackers and TRISCUIT crackers. Preheat the oven to 400 degrees. Spray an 8 x 8 baking dish with baking spray. 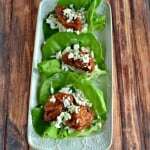 In a large bowl combine the cream cheese, sour cream, ½ cup BBQ sauce, chicken, ½ cup cheddar cheese, salt, pepper, onion powder, and garlic. Mix until well combined. Combine the remaining BBQ sauce with the buffalo sauce and pour over top of the dip. Combine the remaining cheddar cheese and crushed RITZ crackers together. Sprinkle over top of the dip. Bake for 20 minutes or until the mixture begins to bubble and the cheese is melted on top. Serve hot with RITZ crackers and TRISCUIT crackers. 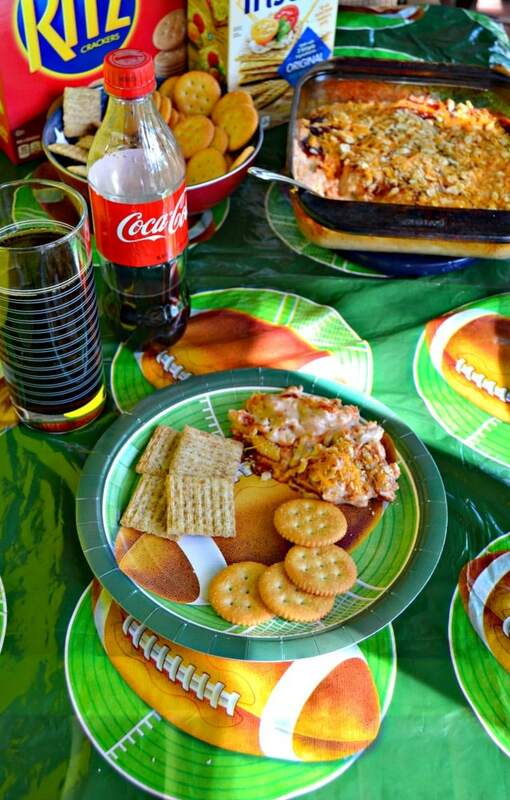 What a fun and delicious spread, Heather! Love the sound of that chicken dip! This does sound delicious and like the perfect thing for a Sunday afternoon watching football! This dip sounds fabulous. Perfect for game day! Ohhhh this sounds so so good!! Definitely making this one asap! This sounds so good! I make a similar dip that is always a hit at parties! I’ll take a whole bowl of it, please! 🙂 Yum! I love buffalo chicken dip! Its one of my favorites! 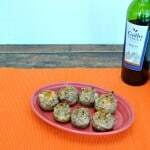 This is going on my game day menu right now! This sounds so good. I even saw Ritz crackers in the store the other day, although the box was so tiny. I will have to try this out. This sounds so tasty! I’m always looking for new dips to try out for gameday! Looks like a great dip! I am a big fan of football and am excited for the season! I’ve got to try this dip! There’s nothing more delicious than bbq chicken except it being in dip form! This looks like a delicious dip for game day! I just might have to make it this weekend! Sounds delicious and so filling! Thank you so much for the recipe. Will be perfect for our next get-together.